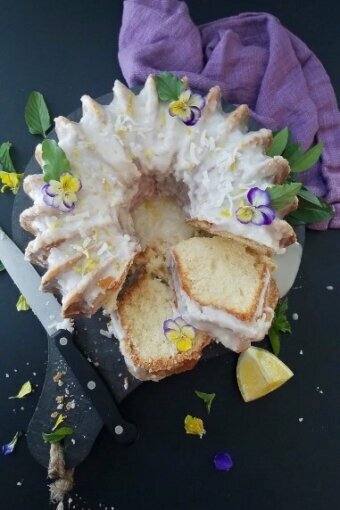 A lighter, airy lemon coconut pound cake topped with lemon glaze to celebrate Mother’s Day or just because! Learn how to achieve a less dense pound cake. Happy Mother’s Day to all you moms out there! You make our lives sunny and bright. That is why we’ll be celebrating this important date with a beautiful and delicious Lighter, Airy Lemon Coconut Pound Cake this year. Definitely, not the pound cake you may be used to. It’s something special… for the extraordinary women in our lives. The classic pound cake traditionally incorporates a pound of each of four ingredients: flour, butter, eggs, and sugar, resulting in a dense cake — so popular in Southern United States. Ours, however, uses baking powder to induce leavening during baking, which results in a less dense cake. Because it is flavored with lemon juice, an acidic ingredient, baking soda is added to neutralize that ingredient and help the batter to rise. Cornstarch is used in combination with flour to soften the harsh proteins of the flour, resulting in a more tender cake. The egg whites are separated from the yolks in our cake. By beating the whites separately and incorporating them at the end of preparing the batter, it makes the cake airy. All these factors contribute toward a lighter, airy pound cake. You see? The process is quite simple. First, beat room temperature butter and sugar until light and fluffy. Beat in the egg yolks until lightly pale. Add sifted flour and cornstarch combined with baking powder and baking soda alternating with a mixture of lemon juice and coconut milk. Beat until just incorporated. Stir in shredded coconut if desired. Last, fold in beaten egg whites and pour batter into a greased and floured bundt pan. Bake in a 350 F preheated oven for about 40-50 minutes or until a toothpick comes out clean. Let pan cool on an oven rack for about 10 minutes. Unmold cake and pour a lemon glaze on top. I was absolutely delighted! I hope your Mom, Grandma, or that motherly figure in your life enjoys this Lemon Coconut Pound Cake as much as I did. From one mom to another (with much love), I wish you a HAPPY MOTHER’S DAY! 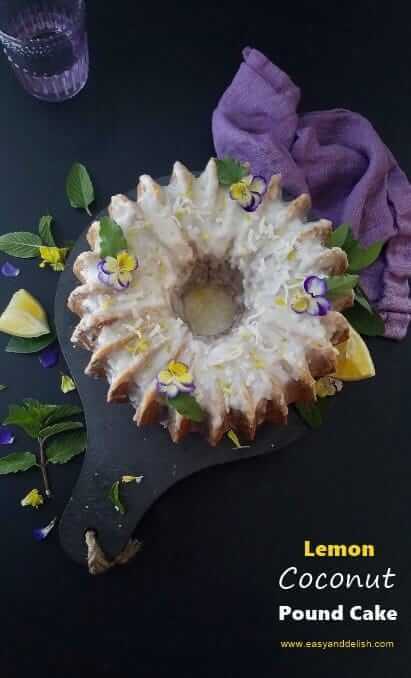 A lighter, airy lemon coconut pound cake topped with lemon glaze to celebrate Mother's Day or just because! Learn how to achieve a less dense pound cake. Preheat oven to 350°F. 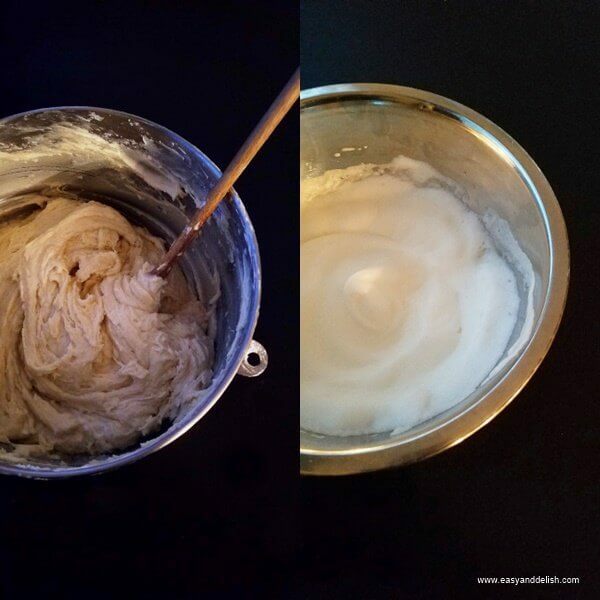 Grease and flour a 8-inch bundt pan. Make sure to remove excess flour. Combine butter and sugar in stand mixer bowl, and beat on high speed until light and fluffy. Beat in the egg yolks until lightly pale. In a separate bowl, combine flour, cornstarch, baking powder, and baking soda and then sift twice. Slowly add flour mixture to the butter mixture, beating just until combined. Beat in lemon juice and coconut milk. Add coconut flakes if desired. 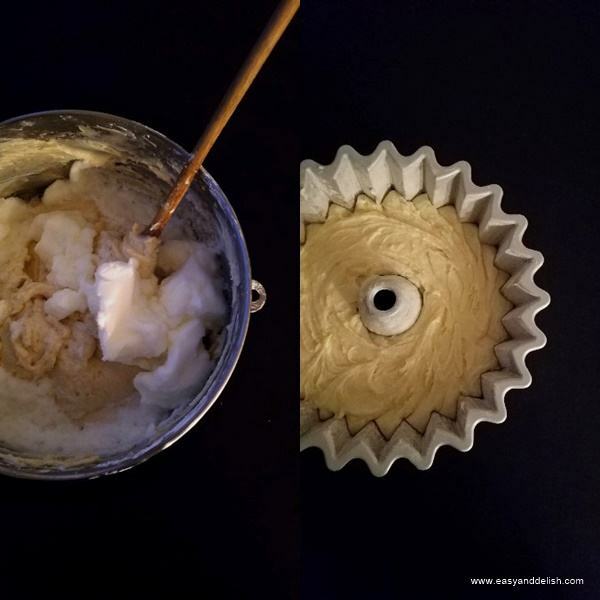 In a separate bowl, beat egg whites until stiff and then fold in the cake batter. Pour cake batter into prepared pan and bake for about 40-50 minutes or until toothpick inserted comes out clean. Cool in pan on a wire rack for about 10 minutes and then unmold cake onto a serving plate. 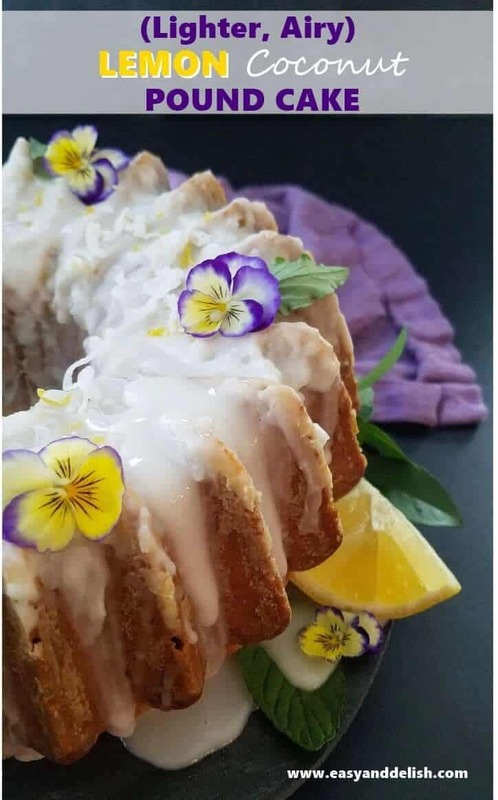 During those first 10 minutes while cake is cooking, prepare the lemon glaze. In a bowl, whisk sugar and lemon juice until obtaining a homogeneous, no lump mixture. Once cake is unmolded, pour lemon glaze over the cake and if desired, garnish with lemon zest. Enjoy! This lemon coconut pound cake can be served by itself or with your favorite ice cream. Please store cake covered at room temperature. I’ve never met a pound cake I didn’t like! This lighter version sounds fabulous. And perfect with just in-season strawberries. Happy Mother’s Day Denise! Lemon? I’m in! Love the stuff. And it works so well in a pound cake. This looks terrific — thanks. 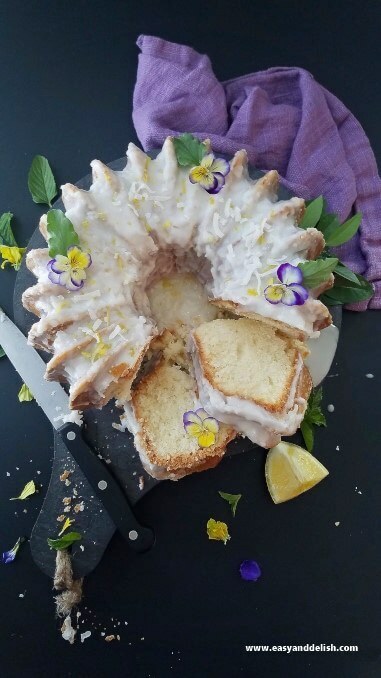 Lemon is a great addition to pound cake. I like the dense texture of the traditional version — which is discussed in the recent book “Baking Powder Wars” where the whole development of baking powder is shown to have caused a revolution in the kitchen a couple centuries ago. What a beautiful dessert! I can’t wait to bake it myself! Best! That dessert is beautiful and looks delicious! Love it! There is something about pound cake and summer that seem to go together so well. 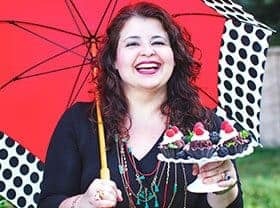 Thank you for such a lovely recipe. I love pound cakes and coconut, a great combo!